Welcome to this charming 2/2 villa with beautiful Terrazzo floors that lives like a single family home and has a real neighborhood feel. Meticulously kept, one of the favorite features of the owners is the 30×7 screened in Florida room that is their oasis with a hammock for lazy afternoons and grilling right outside your back door. This home comes nicely turnkey furnished with a pull-out sofa in the second bedroom, plus the roof and A/C are new in 2015 and the pipes have been relined and are like new. Spanish Main Yacht Club is a waterfront community with a 40 slip deep water marina that holds up to 45-foot vessels with electric, water and renovated docks. 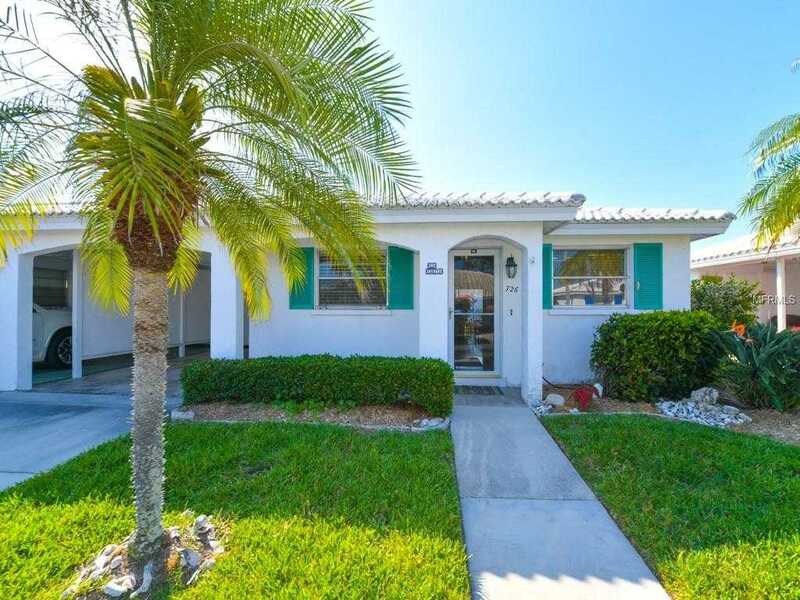 A very active boating and social community with upscale clubhouse, heated community pool with fabulous water views, deeded beach access to the quartz sugar sand beach of Longboat Key. Whether you enjoy boating, kayaking, fishing, you only have to step out your door to enjoy it all. Golf, tennis, fabulous dining and entertainment and just minutes away not to mention St. Armands world-renowned reputation for great restaurants and shopping. You don’t have to be 55 to purchase in Spanish Main and the community is pet-friendly and boat slips are leased and one of the least expensive on Longboat Key. Please, send me more information on this property: MLS# A4402414 – $329,000 – 726 Spanish Dr N, Longboat Key, FL 34228. I would like to schedule a showing appointment for this property: MLS# A4402414 – $329,000 – 726 Spanish Dr N, Longboat Key, FL 34228.